The Critical First Step in Achieving Your Writing Dream (It’s Not What You Think) | Writing & Book Coach | Marla Beck, M.F.A. If you’re like many of the writers in my community, somewhere deep in your heart dwells a writing dream that’s dear to you. But your writing dream? It’s a little more nuanced. You see, when you find yourself awake in the middle of a long, dark night, mulling over your life and wondering what matters most — a different desire surfaces. 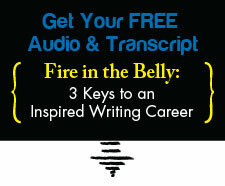 You realize that your “writing dream” may actually be more luminous –and simpler – than you thought. You realize you just want to enjoy writing again. ✔ You want to write freely. ✔ You want to write consistently. ✔ You want to write purposefully. You’ve done the personal development work – and lived long enough, to know that money, opportunity, fame may all come in time. Especially when you’re on course, deep in your writing groove, and focused on writing what matters most. Your very first task is to reclaim your writing joy and reintroduce writing into your life, so the time you spend enriches, inspires and assists you in (step-by-step) developing the kind of fulfilling writing career you desire. If your very first step in achieving your writing dream is simply to reclaim your writing joy, freedom and focus… this makes getting started with your writing dream a heck of a lot simpler. It is not easy to stay focused and trusting and on-track, all on one’s own. That’s why I hire my singing teacher to guide me. That’s why writers bring me into their lives as their guide and coach. This advice will serve you well: don’t make your writing dream so far-off and gargantuan that you never allow yourself to begin pursuing it. Focus first on getting back to writing — joyfully, purposefully and well. Trust me: as you practice your craft and hone your focus, your writing dreams will become more real and your writing path more attainable. To do this takes staying focused, positive and supported on your writing – one writing week at a time. I’m not saying this is easy. I am saying the sense of happiness, satisfaction and joy you’re going to feel makes this journey absolutely worth it. Previous post: This kind of writing progress? It’s absolutely possible for YOU, too.